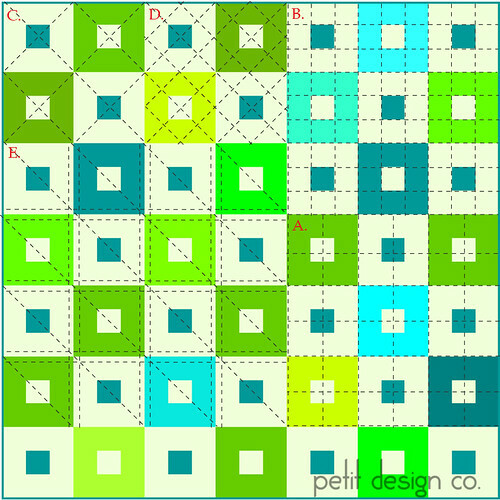 A) Large Scale Grid: This one is quilted down the middle of each block. You can SID as shown or not, it’s up to you. D) Diagonal Small Scale Grid: Once again this design adds lots of texture to an area but will require lots of time to create. Don’t forget that you can always double or triple your lines and that random spacing will give you a more whimsical look. Tomorrow is Sunday. I’ve rounded up some beautiful pictures for you to look at! I've found that I get less attempted puckering (because I don't allow that. lol) when I do diagonal quilting than when I it horizontally or vertically. I'm not sure why-maybe the bias is more forgiving. My sister tried it and had more trouble with diagonal lines. I finished my quilt top that I thought I'd straight line quilt, but all my seams are not perfectly straight. Would you suggest diagonal quilting to mask the imperfection, or should I just fmq squiggles? That is what I usually do.